Patio Comfort is a line of outdoor heaters designed to provide cost efficient heating	that creates warmth and comfort throughout your patio and outdoor spaces. Patio Comfort portable heaters are	manufactured with the highest quality materials, provide a convenient heating	solution for any outdoor event or gathering, and do so while utilizing propane and/or natural gas. Patio Comfort heaters provide the perfect outdoor heating solution for homes and businesses(restaurants,	churchs, apartments, condos, or any company with an outside location that	needs it’s heat controlled). Our heaters are available in a wide variety of colors, mounting options,	and are available in both propane and natural gas models. Our patio heaters are effective and look great! The	VINTAGE	Series by Patio Comfort combines the classic and elegant design of old	world hand crafted aluminum components integrated beautifully into the	latest in safety-orientated, functional, high performance, and long lasting	comfort heating. 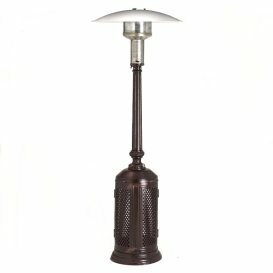 The	VINTAGE	heater is protected with an antique bronze polyurethane powder coating	that is electro-statically applied. The textured finish and color are designed to compliment and enhance your	outdoor entertaining areas. It is completely self contained and portable with uniquie “French	Door” hingled style access doors. Underwriters Laboratories (UL)	approved in the US and Canada. Initially, Patio Comfort heaters were manufactured and marketed specifically	for restaurants. Afterwards, restaurant customers caught on to the unique	warmth Patio Comfort heaters provided as well as their beauty. Today, thousands of people enjoy	Patio Comfort in the privacy of their own homes. 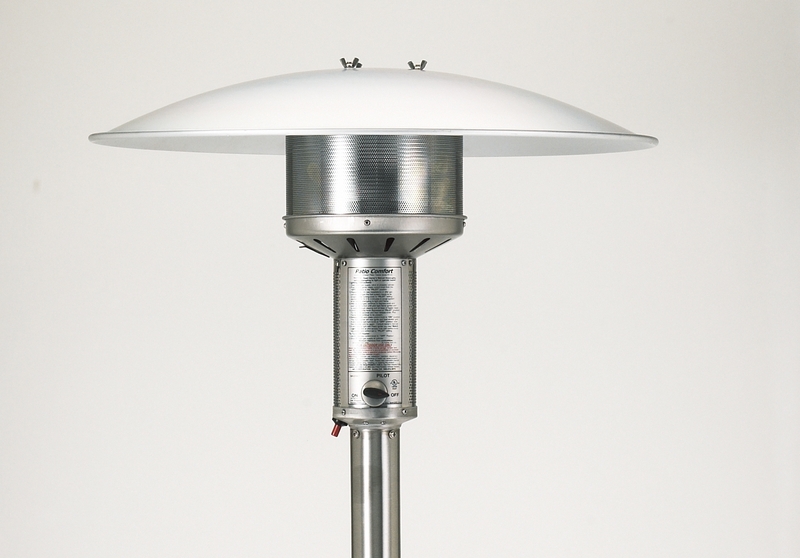 Patio Comfort Heaters utilize infrared heat. Infrared heaters heat people	and solid objects instead of wasting energy by simply heating the air;	This creates a clean and more efficient heating source. Patio Comfort heaters are extremely durable for rainy seasons because they	have non-rust and non-corrosive characteristics. PATIO COMFORT natural gas outdoor infrared patio heaters are designed and	crafted to bring warmth, comfort, safety, convenience, and enjoyment to	your “alfresco” dining and entertaining. The clean, efficient,	and draft free infrared radiant heat feels just like the sun warming people	and objects, while not wasting valuable energy trying to heat the air. Our natural gas powered outdoor heaters are designed for use of your patio,	deck, pool area, or outdoor dining areas well into the cooler months. Only Patio Comfort natural gas heaters are equipped with a 12′ steel-lined	CSA approved hose set and hook up kit. The hose kit includes two all brass	CSA approved quick couplers and brass shut off valve for easy and safe	heater assembly, hook up, movement, and storage. PATIO COMFORT	natural gas outdoor infrared patio heaters are designed and crafted to bring warmth, comfort, safety, convenience,	and enjoyment to your “alfresco” dining and entertaining. The	clean, efficient, and draft free infrared radient heat feels just like	the sun warming people and objects, while not wasting valuable energy	trying to heat the air. Our natural gas powered outdoor heaters are designed for use of your patio,	deck, pool area, or outdoor dining areas well into the cooler months. PATIO COMFORT natural gas	outdoor infrared patio heaters are designed and crafted to bring warmth, comfort, safety, convenience,	and enjoyment to your “alfresco” dining and entertaining. The	clean, efficient, and draft free infrared radiant heat feels just like	the sun warming people and objects, while not wasting valuable energy	trying to heat the air. Our natural gas powered outdoor heaters are designed for use of your patio,	deck, pool area, or outdoor dining areas well into the cooler months. Our Patio Comfort infrared heaters utilize virtually 100% of the fuel they	consume to produce clean warmth. Infrared heaters do not waste precious	energy by trying to heat the air; infrared heating works like the radiant	rays of the sun. This heat distribution will directly heat objects near	them such as people, tables, chairs who in turn will absorb the heat and	reflect it. Infrared heaters are extremely efficient and perfect for a variety of commercial	settings, including poolside or where an outdoor dining area can be found.